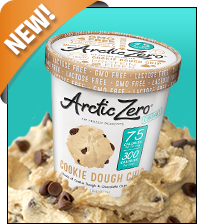 Arctic Zero Chunky Pints Fit Frozen Desserts - The folks at Arctic Zero have kicked it up a notch with their new line: yummy ice-cream-like treats with chunky mix-ins! The Cookie Dough Chip is mind-meltingly good. Other options: A Lil' Bit Chippy, Cool Mint Chip, Key Lime Pie, and Buttery Pecan. And get this: Each 1/2-cup serving has just 75 calories, 1.5 - 2.5g fat, 90 - 110mg sodium, 10 - 11g carbs, 3g fiber, 7 - 8g sugars, and 3g protein (PointsPlus® value 2*). OMG, that Cookie Dough Chip... Ahhh! Click to locate. Yoplait Greek 100 Whips! - These are the best thing to happen to Greek yogurt since John Stamos. The fluffy, creamy treats taste more like decadent mousse than Greek yogurt... So far, the Black Cherry is the HG favorite! Each 4-oz. container has 100 calories, 0g fat, 50mg sodium, 15g carbs, 0g fiber, 12g sugars, and 9g protein (PointsPlus® value 2*). Find them. Buy them. Eat them. Healthy Choice Protein + Whole Grain Café Steamers - If you think the world doesn't need any more Café Steamers, you might want to hold your tongue. These new picks proudly boast 16-plus grams of protein plus hearty fiber-packed grains. Choose from Grilled Basil Chicken, Kung Pao Chicken, Pineapple Chicken, and Sweet & Spicy Orange Zest Chicken, each with 230 - 300 calories, 3.5 - 6g fat, 500 - 600mg sodium, 32 - 46g carbs, 3 - 5g fiber, 3 - 19g sugars, and 16 - 18g protein (PointsPlus® value 6 - 8*). Find them in a freezer case near you. Trend Spotting at Expo West: What's New in Natural Foods? Powdered Peanut Butter. We're loving the powdered PB trend we noticed at the show! Most exciting? A new line by Peanut Butter & Co. -- makers of some of the most indulgent flavored nut butters out there. Fingers crossed for an extra-low-fat version of the brand's White Chocolate Wonderful PB. And although not an expo attendee, JIF is getting in on this action, with fat-slashed powdered PB coming later this year! Coconut, Coconut & More Coconut. After heating up last year, this trend has not cooled down at all. It's all about the coconut snack chips, from companies like Bare Snacks and Organic Made in Nature. Also popular: Products using coconut milk instead of butter, like JJ Sweet's Cocomels. Just watch your portions, because coconut goodies are generally a tad high in the fat department; therefore the calories tend to be high too. Gluten-Free Everything. What wasn't gluten-free at the expo? Coming later this year from House Foods, the new Smart Noodle product is basically the best thing ever -- shirataki noodles with amazing texture, thanks to oat fiber and flax! Amy's is also rolling out new gluten-free meals... the Gluten Free Black Bean & Quinoa Burrito is a must-buy, with 220 calories and 5g fat (PointsPlus® value 5*). And we're slightly obsessed with the now-available Element Snacks: rice/corn cakes coated with frosting. Just 80 - 84 calories for each full-sized cake (PointsPlus® value 2*)… The Sweet Vanilla Orange ROCKS. Which trend are YOU most excited about? Sound off on Facebook! Natural Products Expo West: Like Fashion Week for Healthy Food! Spring starts this Friday, so let's chill out with some iced coffee. 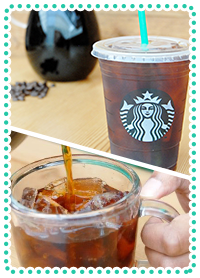 On March 31st, 2,800-plus Starbucks locations will begin serving Cold Brew! How is this different than regular iced joe, you ask? It's made with cold water and a special bean blend for a rich-but-refreshing taste, as opposed to double-strength hot coffee that's watered down with ice. Plus, it's brewed for 20 hours to yield "the right balance of sweetness with citrusy and chocolate notes." Schmancy! ***We didn't see this one coming... Peeps Milk is officially a thing. Yup, it's milk that tastes like Marshmallow Peeps. The flavors are moderately tempting -- Chocolate Marshmallow Flavored Reduced Fat, Marshmallow Flavored Reduced Fat, and Easter Egg Nog -- but we're not sold. Would you drink it? ***In case you missed it, you have GOT to try our brand-new Clean & Green Shamrock Shake! It's even better than our original swap, with clean ingredients and loads of protein. We can't stop thinking about this recipe. We're probably going to make it right now. And that's all we've got. HG out! Click "Send to a Friend," and set up a coffee date to try that new Cold Brew! Oooh, it's National Artichoke Heart Day, March 16th. Heart, shmart... We wanna eat as much of that artichoke as possible!